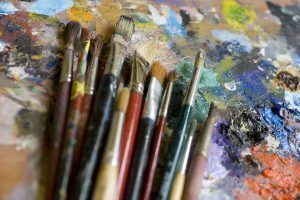 St. Bernard is proud to offer a diverse and burgeoning Fine Arts program. What began several years ago with just a few students has grown into programs which offer a strong appreciation for the arts and are open to students of all talent levels. Middle School Choir – A Choir for 7th and 8th grade students geared to teach the fundamentals of reading music and getting the students ready to participate in the more advanced choir options. Church Choir – this high school aged choir is the largest group on campus. As you can guess from the name the church choir sings for the school masses as well as at the school sponsored annual Christmas concert and the Bloomin Fest. 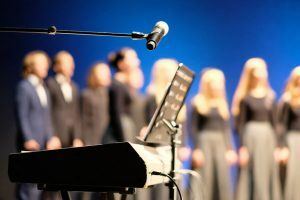 Chamber Choir – A select group of church choir members, chosen through an audition process. The chamber choir will preform not only at the annual concert and festival but also at other special events. This is St. Bernard’s most elite choir. St. Bernard offers 3 different bands, weather a beginner or an expert we encourage all students to get involved! Beginner Band – open to students of any grade, 7th -12th, who want to learn an instrument. We believe a student is never too old to try something new. Concert Band – St. Bernard’s largest band this group plays traditional arrangements and plays at several showcase type events each year. 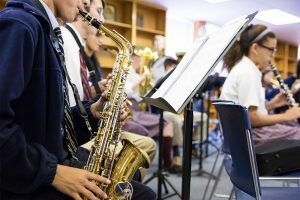 St. Bernard Jazz – The school’s most advanced band, whose members are selected through an audition process, St Bernard Jazz plays a wide variety of music and performs throughout the year getting the opportunity to represent the school in different venues.